Are you tired of having regular pancake in your kitchen and you want a different flavor this time? 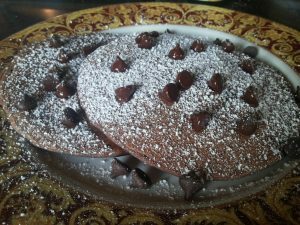 How about some chocolate pancake? that sounds interesting is it?. I was wondering as well and i was wondering like let me try to make this recipe without eggs on it so that its vegetarian since I’m planning to be one in the future (but bacon is always in our fridge hehehe) so skip for now. I tried this recipe and I said “wow this taste good and this can be made as a low budget cake too. So here’s the recipe that i tried. 1.Sift all together the flour, cocoa powder, sugar and baking powder. 2. Stir all the dry ingredients together until well combined. 3. add all the wet ingredients such as vanilla almond milk, unsweetened almond milk, oil water on your dry ingredients. 4. Stir all of them together until well combined or until you cant see any dry ingredients is floating. 5. In your pan brush 1/4 tsp of oil then start cooking. 6. Finally smile and tell yourself “I made it”. Enjoy and Happy eating.